Nirvana Sutra or Mahāparinirvāṇa Sūtra (Chinese: Niepan Jing (涅槃經); Japanese: Nehankyō (涅槃経)) is one of the major texts of Mahāyāna Buddhism. Note that this is one of two Buddhist texts having approximately the same title, the other being part of the Pali Canon. However, both for historical reasons and for the sake of clarity, the former is generally referred to by its Sanskrit title, Mahāparinirvāṇa Sūtra (or simply «Nirvana Sutra»), and the latter by its Pali title, Mahaparinibbana Sutta. The Nirvana Sutra is an enormously important scripture, not least because of its influence on Zen Buddhism and in view of its traditional status as the final Mahayana pronouncements of the Buddha on the eve of his physical death. It is striking for its teachings on the eternal, unchanging, blissful, pure, inviolate and deathless Self of the Buddha. Here the sutra controverts the familiar Buddhist dictum that «all dharmas are non-Self», and in the Dharmakshema version the Buddha even declares that «in truth there is Self (Atman) in all dharmas«. Much of the central focus of the Nirvana Sutra falls on the existence of the salvific Buddha-dhatu (Buddha-nature, Buddha element, or Buddha principle), also called the Tathagatagarbha («Buddha-matrix» or «Buddha embryo»), in every sentient being (animals included), the full seeing of which ushers in Liberation from all suffering and effects final deliverance into the realm of Great Nirvana (maha-nirvana). This «True Self» or «Great Self» of the nirvanic realm is said to be sovereign, to be attained on the morning of Buddhahhood, and to pervade all places like space. The Buddha-dhatu is always present, in all times and in all beings, but is obscured from worldly vision by the screening effect of tenacious negative mental afflictions (kleshas) within each being (the most notable of which are greed, hatred, delusion, and pride). Once these negative mental states have been eliminated, however, the Buddha-dhatu is said to shine forth unimpededly and the Buddha-sphere (Buddha-dhatu/ visaya) can then be consciously «entered into», and therewith deathless Nirvana attained. The Tathagatagarbha is presented by the Nirvana Sutra as a wholly positive, liberative power, and is stated by the Buddha, in the earliest extant version of the sutra (the «six fascicle text» of Fa-xian, q.v. ), to «nurture/sustain the person». It is further called «true life» (true «jiva«), and said to be utterly invulnerable to harm. It is likened to a «precious jewel» and is described as being «indestructible like a diamond» — the hardest substance known to mankind. The highest form of Nirvana — Mahaparinirvana — is also discussed in very positive, «cataphatic» terms in the Nirvana Sutra. Mahaparinirvana is characterized as being that which is «Eternal (nitya), Blissful (sukha), the Self (atman) and Pure (subha). This state or sphere (visaya) of ultimate awareness and knowingness (jnana), however, is said to be accessible only to those who have become fully awakened Buddhas. Even 10th-level Bodhisattvas (i.e. the very highest level of Bodhisattva) cannot clearly perceive the Buddha-dhatu and fail to see with clarity that the immutable, unfabricated Dhatu dwells indestructibly within all beings. The longer versions of the Nirvana Sutra additionally give expession to the new claim (not found in the shorter Chinese and Tibetan versions) that, because of the Buddha-dhatu (Buddha-principle/ Buddha-nature), absolutely all beings without exception, even icchantikas (the most incorrigible and spiritually destitute of beings), will eventually attain Liberation and become Buddhas. Some scholars detect Brahmanist or Hindu influence upon this scripture, but the text itself is at pains to distance itself from all such (from its own point of view) «heterodox» teachings and asserts itself to be quintessentially Buddhist. The «six fascicle text», translated during the Eastern Jin Dynasty by Buddhabhadra and Faxian between 416 and 418, T 376.12.853-899. The «northern text», with 40 fascicles, translated in the Northern Liang kingdom by Dharmakṣema between 416 and 423, T 374.12.365c-603c. 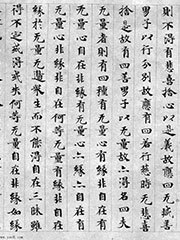 The «southern text» with 36 fascicles, complied in the Liu Song Dynasty by Huiguan and Huiyan, in approximately 453, T 375.12.605-852. The «Tibetan text», translated in 8th century Tibet by Jinamitra, Jnanagarbha and Devacandra. It is also known from Chinese catalogues of translations that at least two other Chinese translations were done, slightly earlier than Faxian, but these are no longer extant. «When I have taught non-Self, fools uphold the teaching that there is no Self. The wise know that such is conventional speech, and they are free from doubts. «It is not the case that the inherent nature of Nirvana did not primordially exist, but now exists. If the inherent nature of Nirvana did not primordially exist, but does now exist, then it would not be free from taints, nor would it be eternally present in nature .. is primordially existent and does not just come into existence in the present. Because of the obscuring darkness of the mental afflictions, beings do not see it. The Tathagata, endowed with omniscient awareness , lights the lamp of insight with his skill-in-means and causes bodhisattvas to perceive the Eternal, the Bliss, the Self and the Purity of Nirvana.» (Dharmaksema version) (Translations based on Stephen Hodge). The text contained in the Faxian and Tibetan translations is roughly equivalent to just the first quarter of the greatly expanded Dharmaksema version. Given that all known Sanskrit fragments correspond solely to material found in the Faxian and Tibetan versions, and the corresponding part of Dharmaksema, it is generally accepted that this portion of the text was compiled in India, possibly, as the text itself hints, somewhere in southern India, before it was transferred to Kashmir. The additional material in the long Dharmaksema version would seem to be of Central Asian origin. Like the majority of Mahāyāna sūtras, the Nirvana Sutra evidently underwent a number of stages in its composition, which is of some importance for any discussion of the Tathāgatagarbha and Buddha-nature (buddha-dhātu) doctrines. A leading scholar in this field is the Japanese scholar Masahiro Shimoda, who posits a short proto-Nirvana Sutra, which was he argues was probably not distinctively Mahāyāna, but quasi-Mahāsanghika in origin and would date to 100 CE, if not even earlier. He suggests that an expanded version of this core text was then developed and would have comprised chapters 1, 2, 3, 4, 6 and 7 of the Faxian and Tibetan versions, though it is believed that in their present state there is a degree of editorial addition in them from the later phases of development. Shimoda argues that the main theme of this core text was the permanence and transcendence of the Buddha and that the treatment was strongly Mahāsanghika in its «theology». At this stage of the textual history, the living eternal presence of the Buddha in the great caityas would have been the main concept. The prevalence of this kind of thinking is corroborated by several of Gregory Schopen’s essays dealing with the belief that the Buddha was still present as a living force in the caityas containing the remains of his body. The key technical term in this portion of the text is buddha-dhātu. This term is difficult to translate because it has several ranges of connotation, all of which are implied by the use of the term in the text. Apart from the spiritual dhātu or nature of an embodied Buddha, dhātu also refers to the relics enshrined in the caityas. Because these dhātus are enclosed in the caityas, this makes them alive with the Buddha: he is considered to be still present in a real sense. This is what made pilgrimages to caityas so important, to the extent that many people, including possibly the followers of the Nirvana Sutra at this stage of the text, wanted to pass into nirvāna in the presence of the Buddha dwelling there. Contrary to earlier scholarly understandings of Buddhism, this seems to have been a very widespread idea and wish. The presence of the Buddha is also dealt with in other ways in early Mahāyāna texts, but the overall concern is the same: how to enter into the presence of the Buddha for the salvific benefits this would offer. Hence the Sukhāvatī-vyūha Sūtras and other Pure Land texts, and the Pratyutpanna Sūtra also deal with the means to achieve this. A close reading of its text leads scholars to argue that the people who promulgated the Nirvana Sutra, at least at this early stage of its composition, were neither monks nor laymen, but a previously unremarked group of Buddhist practitioners, who called themselves ācāryas (teaching masters). Their role is clearer in what are believed to be the earlier portions of the Faxian version, though they had already begun to be written out of the frame by the time of the second phase that comprises the remaining chapters of the Faxian and Tibetan versions. From the account given in the text, it seems that these people did not live sedentary monastic lives, but travelled as preachers (dharma-bhānika) and pilgrims. They followed a kind of Vinaya, but one based on the sūtras rather than one of the conventional Vinayas used in the monasteries. Thus, they could perhaps be linked with the forest-dweller tradition, given that they held themselves aloof from the monasteries and did not engage in the type of criticism of the lax monastic life-style that is characteristic of the later layers of the text. Importantly, it seems from the Nirvana Sutra that these ācāryas also came to see themselves as bodhisattvas, which might challenge the popular idea that Mahāyāna had its origins as a lay movement. The second textual phase, which can actually be further sub-divided, suggests important changes in the Nirvana Sutra movement. The proponents increasing became sedentary, though some degree of wanderering still seems to have occurred. However, this shift to a sedentary life-style had immediate repercussions which can be seen in this part of the text. Sociologically, there are vehement criticisms of lax, corrupt and venal monks who alter the Vinaya to suit their life-style. The kind of things being criticized seem to correspond in large measure to exactly the accommodating changes that the Mūla-sarvāstivādins made to their Vinaya. In contrast, the Nirvana Sutra shows some connections with the Mahāsanghika Vinaya, though these connections may well be the result of convergent development. That is, the early exponents of the Nirvana Sutra were not necessarily Mahāsanghikas themselves, but may have become affiliated with them. It is at this phase of textual development that the concept of icchantikas makes its appearance. This term was first used to denote the many worldly monks leading settled lives. It was then extended and worsened in its connotations to include those who have destroyed any chance of liberation in themselves. The later idea that they somehow become freed by divine intervention or otherwise is not found in the earlier portions of the Nirvana Sutra, which on the contrary suggests that eventually all beings who can be saved by any means will be saved by the Buddhas, who will then cease to appear in the universe for all eternity. This view was apparently modified in slightly different ways both in China and Tibet, but in a manner that give icchantikas some hope of eventual liberation. It is also at this stage of development that the Tathāgatagarbha concept makes its appearance in the Nirvana Sutra. As in the case of buddha-dhātu, this term also appears to have strong links to the caitya veneration, for as a technical term, a garbha can either be the enshrined contents of the caitya or the caitya itself. Glossing tathāgatagarbha as a bahuvrhi compound, the caitya is a tathāgata-container. This interpretation underlies the position of the Tathāgata-garbha-sūtra with respect to living beings: they all contain the, or perhaps a, Tathāgata. The other interpretation of the term, as a tat-purusha compond, is that the tathāgatagarbha is the enshrined content of the caitya . The Nirvana Sutra adopts this interpretation as its viewpoint, that beings are embryonic Tathāgatas by virtue of the pervasiveness of the buddha-dhātu. This therefore became the central message of the Nirvana Sutra, that all beings are potential Tathāgatas by virtue of buddha-dhātu or tathāgatagarbha. The Mahayana Mahaparinirvana Sutra in 12 Volumes, translated by Kosho Yamamoto and edited by Dr. Tony Page (Nirvana Publications, London, 1999 — 2000).